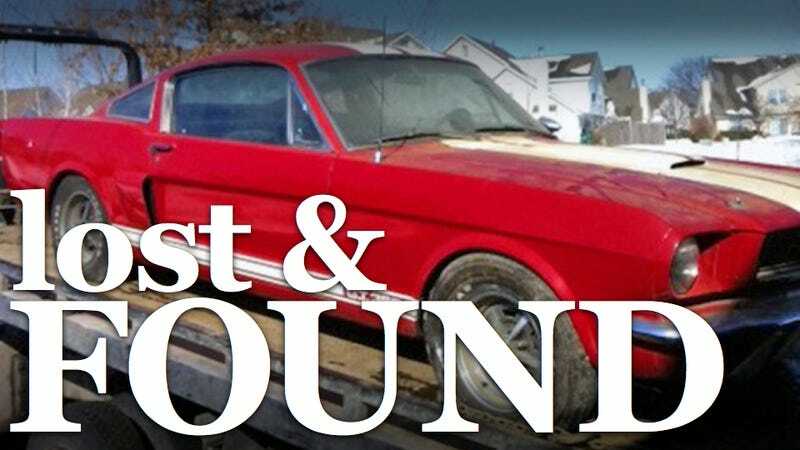 In a couple of weeks, this rare 1966 Shelby GT350 will cross an auction block after spending 26 years ensconsed by junk in a shed behind a Kansas apartment complex. Here's how the state of Texas liberated it. In the world of collectable cars, few words have become more loaded than "barn find" — the pristine ideal of a neglected classic, parked and forgotten but still protected from the elements, which emerges from a chrysalis of dust metamorphosed into a treasure. The truth behind such classics is often far messier, with enough legal tangles and family tragedies to fill a Dickens novel. Back in 1966, Shelby American resold plain V8 Ford Mustangs with a host of upgrades and racing improvements, including a power bump to 306 hp. Of the 2,378 built, some 1,003 were sold to Hertz which rented them for racing; most came with black-and-gold paint schemes, but a few were sold in red, as this one was to a Hertz office in Georgia. After being rented for about a year, the car was sold to Anbeth Youngquist in Miami in October 1967. Her daughter, Gail Youngquist, registered the car with the Shelby Owners of America club in 1974 while living in in Kansas, and on June 27, 1976, a Conoco station changed its oil, noting 87,370 miles on the odometer. Then it disappeared. And things get a little strange. Anabeth Youngquist's husband and Gail Youngquist's father is Rex Youngquist, a Kansas landowner and developer who had a few disputes over his property and with local authorities. Seven years ago, Youngquist was sued and ordered to pay more than $110,000 after one of Youngquist's daughters who managed the Villa 26 apartment buildings he owned in Lawrence, Kan., refused to rent a unit to an interracial couple. In 2006, Youngquist claimed a Kansas county owed him $11 million in damages for construction debris on his land based on a "perfected judgment" he drew up without going to court. And shortly after that, Rex and Gail Youngquist launched a oil drilling exploration in Texas — without any of the permits required by Texas law. When the state of Texas sued the Youngquists in 2008, Rex Youngquist replied with a letter sent from Panama, saying he didn't know who Gail Youngquist was and didn't remember "any of the stuff" in the state's lawsuit. Other filings indicated the Youngquists were members of the "nation of Kansas" and that "outlying minion islands" did not have dominion over them; the Youngquists have sent other legal papers back signed with their thumbprints in blood. Last year, a Texas judge ruled in favor of the state, hitting the Youngquists with $624,805 in fees and fines. The collection was turned over to Houston attorney Peter Pratt, who sought out any property the Youngquists held in Kansas — namely, the Villa 26 apartments, which were seized by the Lone Star State in January. The new manager of the Villa 26 found three sheds behind the building filled to their rafters with what he called "the detritus of life" — old barbecue grills, water skis, old tools and other household junk. Pratt told him to empty the shed since the sheds could be rented; they also posed a fire hazard. When the manager started to remove the junk from one shed, the outlines of a car appeared. Much of the Shelby's fabrics were covered in mold; the odometer had just a couple thousand miles more than it did when the oil was changed in 1976. Based on the records, Pratt estimates the car had been sitting in the shed since at least 1985, untouched. Inside the Villa 26 were also the documents needed to prove the Shelby's authenticity. To satisfy the judgement against the Youngquists, the Shelby will be sold by Leake Auctions in San Antonio in two weeks. Outside of the mold, there's little else amiss; the engine has been cleaned and runs, and even the tires hold air. Similar examples of well cared-for GT350 Hertz editions have sold for $100,000 to $200,000. Our attempts to reach Rex or Gail Youngquist were unsuccessful, but we'd still like to know if they ever realized they didn't need to dig holes in Texas to strike it rich.